Japan’s run at the 2010 FIFA World Cup came to an end in the round of 16 when they were beaten 5-4 on penalties by Paraguay. The Blue Samurai and the red and white clad South Americans played out an largely uneventful 90 minutes in which the Japanese seemed tired and the Paraguayans refusing to be caught on the counter. Unlike the Denmark game there were very few set-piece opportunities throughout the match for Japan and during open play Keisuke Honda was kept in check by the Paraguayan defence. After regular time thee was another nervous 30 minutes of extra time before before referee Bleeckere indicated that the match would go to penalties. With the scores at 3-2 Japanese defender Yuichi Komano clipped the crossbar while missing his penalty giving Paraguay the advantage, an advantage they didn’t give up as they went on to win 5-4. I predicted in my post about Japan’ chances at the 2010 World Cup that Japan would make it though to the round of 16 and hoped that this momentum would have pushed then at least into the last eight. This was not to be but I am happy the Japanese represented their country well in the opening game against Cameroon and provided awesome entertainment in the game against Denmark. Things are really starting to get interesting in the World with powerhouses like France and Italy heading home and teams like Brazil and Argentina starting to sparkle at the right time. They played like the warriors they are, and even though I was expecting a long range bomber or some magic from a set play , I was truly impressed with this team. One image is stuck in my mind though Kirk, and it is seeing a Japanese woman clapping with her hands above her head, while she cried. What devotion. 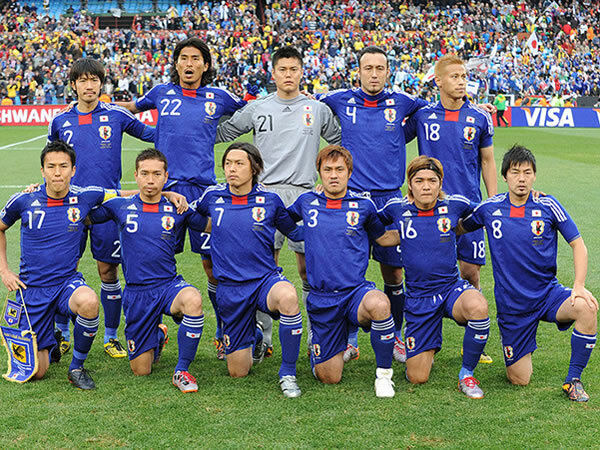 I still say this is the best JAP World Cup Team yet! An unfortunate end =( I truly dread it when the match comes to PKs. The margin between victory and defeat is always so narrow and that can make a loss a little harder to swallow. Plus, I can’t think of many instances where the teams I’m rooting for win on PK >_> haha. It’s a shame, but they had a pretty good run. The Japanese team can look forward to the Olympics now. I think they’ll do well.